Jocasta Nu was a female Human who served as the Chief Librarian of the Jedi Archives during the final days of the Galactic Republic, with a penchant for being a bit overconfident in the completeness of her Archives. 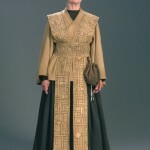 During her career, Nu served as a member of the Jedi High Council and trained many Padawans, including the future Emperor’s Hand, Jerec, Olee Starstone, whom she tutored in the years prior to the Clone Wars, and Jin-Lo Rayce, founder of the Agents of Ossus. Jocasta Nu died when the 501st Legion ransacked the Jedi Temple at the end of the Clone Wars. 1. Yellow-gold or dirty yellow (yellow with a bit of brown) single layer outer tunic. The OT should have some light texture to it. (e.g. raw silk). 2. Obi and mid-calf length tabards of yellow-gold/dirty yellow fabric (different from the tunic), with appropriate dark brown embroidery. Obi and tabards should have rolled/binded edges. Obi should meet together at the back and wrap left end over right in traditional Jedi style. No ties or ribbons. 3. Long dark brown (or black) wrap around skirt. The skirt should have some light texture to it, preferably a vertical crinkle texture. The top layer in front is slightly shorter than the rest of the skirt and ends at the left leg. 4. Dark brown (or black) inner tunic with close fitting round neckline and long sleeves (can also be a dark brown/black underdress with close fitting round neckline and long sleeves or a dickey and false sleeves). 5. Dark brown or black boots–any height, the tops can’t be seen under the skirt. 6. Hair in high bun at the back of the head with two dark hairsticks forming an X. Grey or white hair recommended. Any natural occuring hair color allowed. 7. Big brown suede pouch on the left below the obi. The pouch should be rounded and gathered with a thick black or very dark brown cord at the top (drawstring type). The cord should be long enough to hang down the length of the pouch when the pouch is pulled closed. A type of braided cord or similar preferred. The cord has two large black or very dark brown beads or similar at the ends (one for each end). 8. Jedi librarian tools. There should be 2-3 of different designs closely resembling the ones used in the movie. The tools are attached to a brass ring on a medium brown leather strip. If 2 tools are used, one strip will be enough. If 3 tools are used there must be two leather strips of different lengths with the longer strip holding two tools, and the shorter strip holding one tool. Skirt and IT should color coordinate. It should be noted the original is dark brown and as such dark brown is preferred. OT and obi and tabards must color coordinate. Small shade variations are allowed. Cord and beads for the pouch should color coordinate. 2. A ribbed, horizontal design on the IT.